After eight years as writers and over 30 articles for Ocean7 a constant struggle with the new editor has induced us to swap to Austria’s biggest and most popular sailing magazine. Our new articles can be found in the ‘Yachtrevue’! Welcome to Pitufa.at. This page provides info on our trip around the world aboard SY Pitufa. We started out from Croatia in June 2011. To learn more about us, see “The Crew” page. There, we also describe, how the idea to sail out towards the horizon was born. We write for Yachtrevue now Hello world! The festival ended last week with a torrential downpour that lasted a whole day–even locals claim they’ve never seen rain coming down with such intensity over such a long period. After that followed a week of perfectly calm and finally sunny and warm weather again… Yesterday a tempting weather window to sail to the Tuamotus came up–light northeasterly winds would allow a smooth sail with winds on the beam. We just were not quite ready yet, still had to do some last shopping, internet and errands in Rikitea and we also had not said good-bye to our friends on Taravai. Instead of rushing around we’ve decided to enjoy the nice weather here instead and to head out with the next window. In April 2019 the Gambier Islands hosted a cultural festival. Singers, dancers, drummers came from all over French Polynesia and presented the differences between the Gambier, the Australes, the Tuamotus, the Societies and the Marquesas. 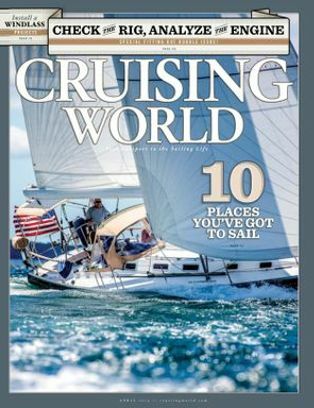 We have a few articles accepted for publication in the renowned Cruising World magazine, and the first one has now actually made it into the April issue. This one is about our stay in Penrhyn. Birgit Hackl, Christian Feldbauer: A Cook Islands Highlight, Cruising World, April 2019. This summer we get more windy and rainy weather here in the Gambier than usually. We don’t mind so much as we have plenty of jobs on our to-do list. At the moment the southeasterly’s blowing hard, but we’re tucked into a little, protected bay getting some work done. So far we’ve done engine maintenance (changed diesel and oil filters followed by a thorough bilge-cleaning), maintenance on the watermaker and the past two days were dedicated to sails: the leech line of our yankee headsail had chafed through, so we took the sail down and sewed patches over the damaged parts (fortunately our old ‘Pfaff’ household machine’s up to such work…). Today we stowed it away, got the big genoa up that we use for downwind sailing and rearranged the forecabin. The weather’s back to gorgeous summer conditions here and we’re exploring the more remote islands of the archipelago. Just now that we have a visitor (my dad is here) the weather has turned unseasonably nasty in the Gambier. A trough with fronts, strong winds and lots of rain has kept us mostly on the boat for the past 4 days. There were 30 boats in Rikitea, which made life in the anchorage quite exciting when the boats were swirled around in gusts and some of them dragged. Now we hope for some settled weather! To protect the delicate coral and to make life easier for visiting cruisers, we installed a mooring together with the community of Rapa Iti. This mooring can be picked up at S27°36.808' W144°20.034'. More moorings are planned. Ever since we arrived in the Gambier we’ve had perfect sunny, breezy and hot summer weather. We really needed these conditions after the rainy time in Rapa Iti–we had accumulated two laundry bags full of humid clothes (yuck) and due to the lack of circulation the interior of the boat was mouldy all over. We stayed out on the motus, spent a week doing laundry in the mornings, cleaning furniture afterwards (first with vinegar then with oil, we call it the ‘salad treatment) and we still found time to go snorkeling in the afternoon and hang out with friends. Finally we’re flying along with 7 knots in SE winds and we’re right on course. Unfortunately the grib shows NE winds for later on–that would be noserlies for us… We hope for the best, 110 nm to go!